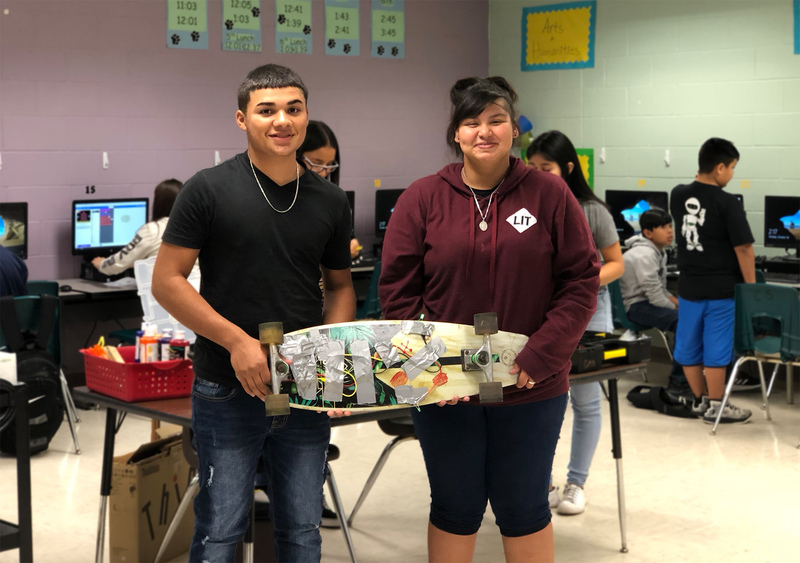 Ariadna Garza and Josue Vargas, eighth-graders at Gutierrez Middle School, created a skateboard with a safety feature that increases the visibility of skateboarders at night. Their project is part of a new class called Computer Science for Innovators and Makers that is now offered at all five Harlingen CISD middle schools. With a little ingenuity, loads of software development and a dash of hardware design, students are discovering computer science concepts and skills by creating personally relevant, tangible, and shareable projects. The duo put their heads together to develop their concept using programmable blinking LED lights. With features like individually-programmable LEDs, programmable buttons, light and temperature sensors, motion sensors (accelerometer and compass), and wireless communication (via radio and Bluetooth), micro:bit can be anything the students create it to be. It is a process students have learned well: identify the problem, find a solution, code it, and test it. The 9-week computer science class and its counterpart App Creators that was implemented last year are both part of the Project Lead the Way Gateway curriculum. Caballero said that while there is no particular order in which the students must take the classes, students may benefit from learning the programming fundamentals taught in Computer Science for Innovators and Makers before moving to App Creators. PLTW Gateway seeks to engage students during the transitional middle-school years through hands-on collaborative activities in computer science, engineering, and biomedical science.